A former Il Corvo cook teams up with the owners of Analog Coffee for a tiny, around-the-corner offshoot that’ll make you rethink any prejudice against fancy toast. 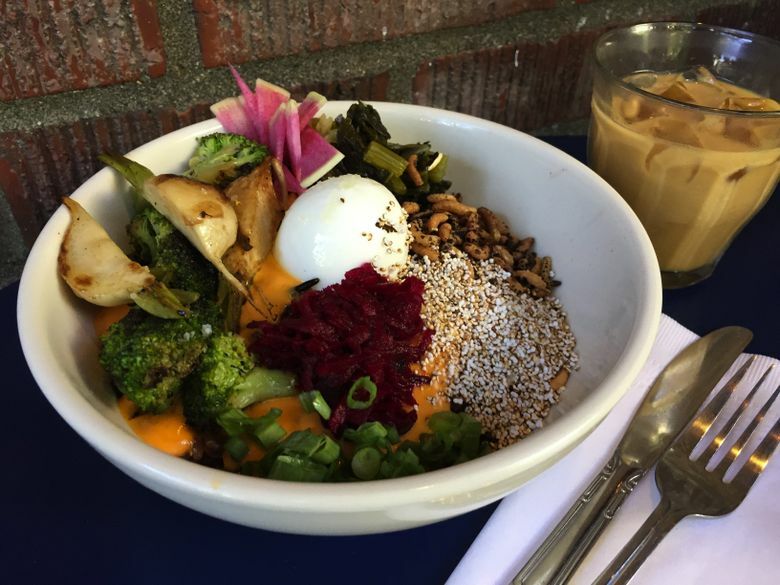 Those who know and love Capitol Hill’s Analog Coffee have been watching and waiting for its new sibling, B-Side Foods. Analog makes some of Seattle’s very best coffee, using beans from “a rotating cast of exceptional local roasters,” organic dairy from Fresh Breeze, and exacting care. It’s run by local cafe veterans Danny Hanlon and Tim Hayden, and regulars include a lot of restaurant industry people, in varying states of bleariness. B-Side dwells in the same classic brick apartment building, just around the corner, where Resto and, before that, Thomas Street Bistro used to be. Jake Vorono, formerly of the great Il Corvo, runs the show. It’s a tiny, funny little spot, with only four two-tops and a little counter seating facing a wall of white and pastel tile (square-shaped, for once, instead of the ubiquitous subway). The menu is tiny, too, just a half-dozen things along the lines of frittata, a rice bowl, nice stuff piled high on thick-sliced toast. The hours are weird: breakfast and lunch only, Friday through Monday, until 2 p.m. [changing to Thursday through Sunday as of October 28] — more days might be added as staff is augmented, but Vorono’s not rushing it. And B-Side doesn’t play the records you’d expect, given the name; it’s vintage in another direction, namely cassette tapes (and someone really likes Fleetwood Mac). With autumn approaching, B-Side’s patio is a lovely, leafy place to be, with bright blue tin tables setting off the red brick. It’s got an awning, too, in case of rain. Some favorites so far: Whatever you might think about the popularity of toasts, B-Side’s trout-topped version is very much worth your consideration. 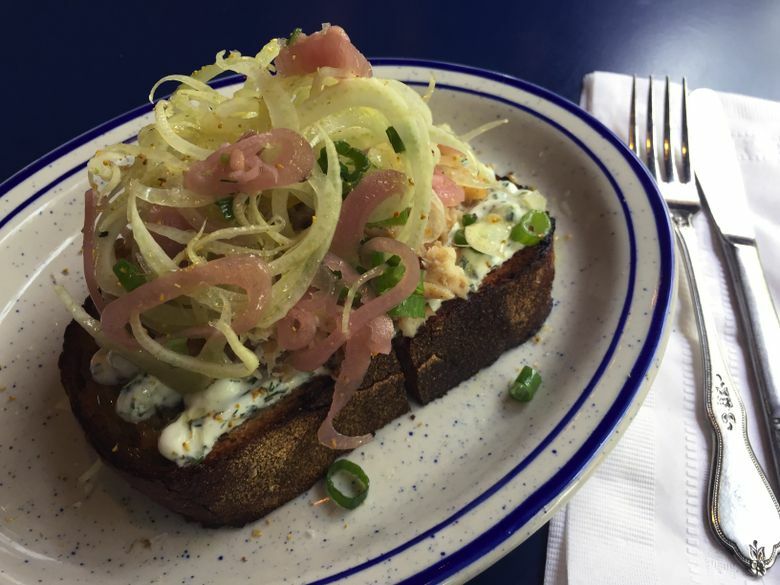 It’s rich but light, with a creamy yogurt dressing between the earthy, roasty rye bread and the smoked trout with its hint of candy-sweetness; on top of that is a 4- to 5-inch-high tangle of crunchy shaved fennel bulb plus pickled shallot, for a faint vinegar high note. It’s a super-delicious study in balanced flavors, and it’s beautiful to behold, too. Downside: It’s messy, cutlery or no — but who cares? 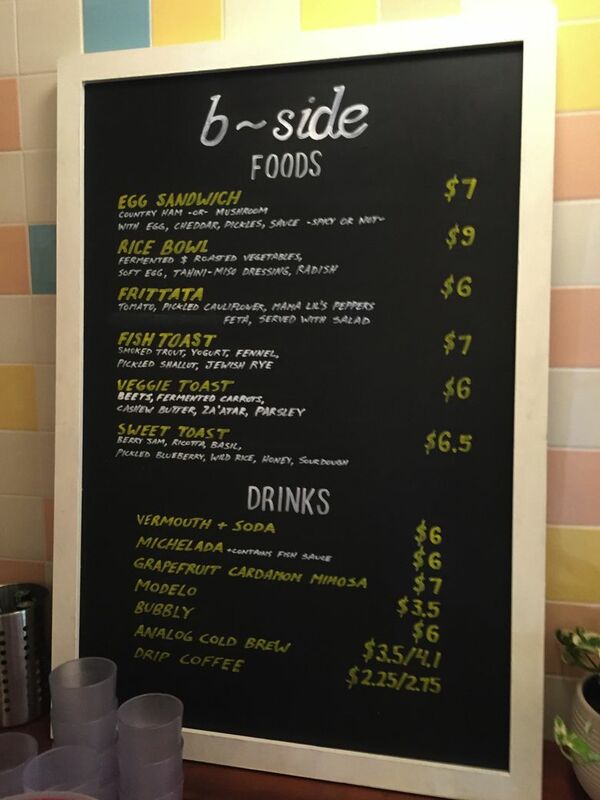 B-Side’s egg sandwich is pretty much perfect, with the right amount of salty ham (or mushrooms, if you must), a thin slice of sharp-ish Beecher’s Flagship cheese, house-made daikon pickles (genius), and aioli. Vorono sources local and organic as possible, and he tried out having English muffins custom-made, only to realize that “Franz’s are exactly perfect and what we need.” You can order your egg sandwich spicy, too, which is an excellent idea (and not too hot), due to owner Hayden’s homemade hot sauce. 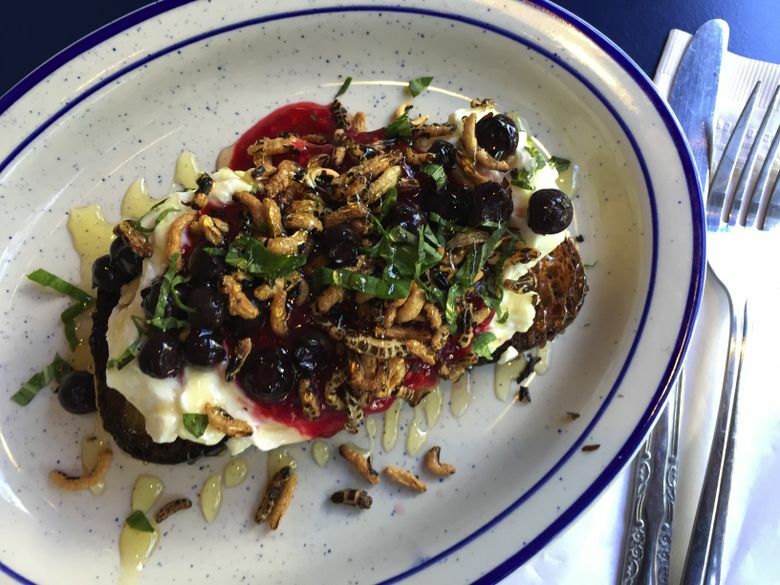 More good stuff: The very pretty “sweet toast” last weekend oozed tart-ish berry jam and a little honey over fluffy ricotta, all dotted with pickled blueberry and (not enough) bits of basil, plus crisped wild rice for extra crunch. The rice bowl avoided tasting too aggressively healthy and looked Instagram-ready, loaded with house-fermented and roasted vegetables, including especially delicious carrots (treated with, Vorono says, “Salt, garlic and time”). Drinks!There’s no hard liquor, but with the likes of a grapefruit mimosa scented with cardamom bitters and a michelada given a bump of fish-sauce umami (plus the rest of the can of Modelo Especial on the side), you won’t mind. Prices: A trout toast ($7), an egg sandwich ($7), a sweet toast ($6.50), and a rice bowl ($9) comes to $29.50 before tax and tip, and would be too much food for two. 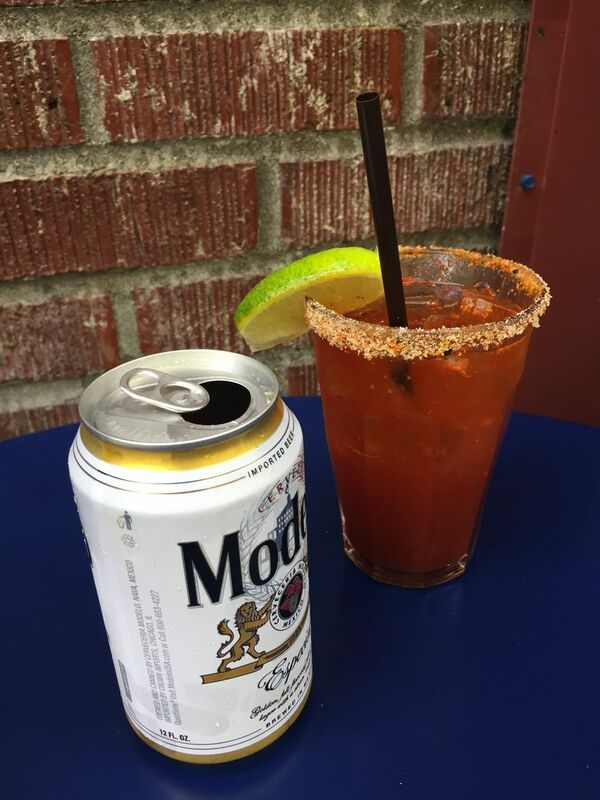 Mimosas are $7 each, micheladas, $6.